If you’re a B2B marketer, for you the customer is king. You’re probably obsessed with them, and you tend to collect several sets of data from them. You’d like to know about the source of your website traffic, referrals, and conversions. How often do they visit your webpages? The conversion rates? Average sessions and bounce rates? What content is getting more impressions on your website? Without this data, marketers can’t decide where they are succeeding and what is holding them back to the ladder of success. Collecting data using tools like Google Analytics is critical, but works effectively. With the addition of tags for expanding business’s online reach, converting leads and for optimizing digital strategy to create a lasting relationship with your audience. If you use this tool to track traffic on your website, then you would know how complicated the whole process can get. 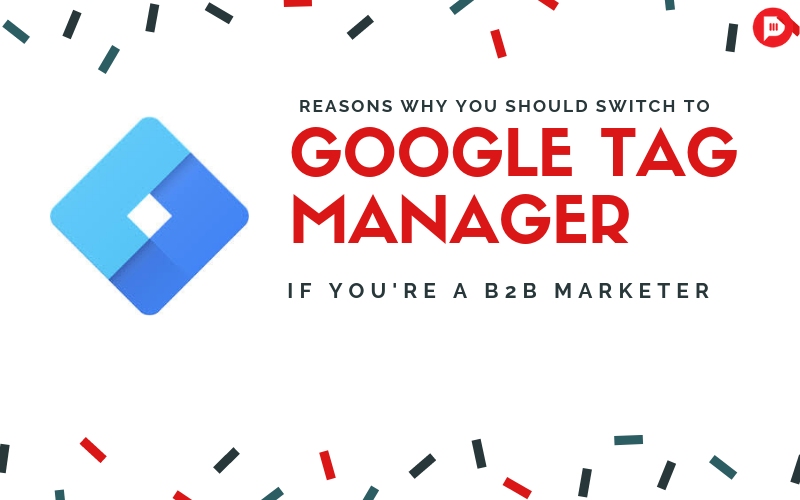 So if you are a digital marketer and you don’t use Google Tag Manager yet, its time to get up to speed. If you’re accustomed to using Google Analytics (GA), it is annoying to track something new. Needing to wait for a week for the web developer to go into the backend of each page you want, change and update the code. But fortunately for marketers, GTM doesn’t require coding. It allows you to easily add, remove and edit tags within the user-friendly workspace and without any assistance from the IT department. Changes to the site are made much faster. Unlike GA, which requires you to add code to each page and leave a huge room for error, GTM enables you to easily deploy trigger types such as page views, button clicks, form submissions, page scroll, and other customs events that you define. GTM minimizes the time between the formation and implementation of ideas. All data from analytic tools are stored in one place. GTM integrates with various third-party platforms, allowing marketers to add tags from the other sites with the click of a button. For example, you can quickly deploy GTM’s LinkedIn Insight Tag to track conversions from LinkedIn ads, automatically deliver targeted remarketing ads to visitors from LinkedIn, and garner additional insights on your visitors. Now, you can set the rules for when tags fire. For example, you can set off a tag when someone clicks “play” on an embedded video on your website. You can then get more granular data on how many people saw a link to the video but chose not to watch it. You merely add a tag the moment the video becomes visible to a user—whether by scrolling, navigating to a page or performing another action. You can even set a rule for what percentage of the element must be visible for the tag to fire. Specific events such as visitors submitting the form or clicking the download buttons are more intuitive and accurate than general pageviews and session durations. At times the tracking conversion can get tricky because if a person visiting “thank you” page, a visitor could refresh the page 10 times and the numbers could throw off. As you can imagine, GTM can be used a lot more than just tracking your web traffic in google analytics. Endless ways for you to customize tags with GTM to track data, and no reason to delay the analytics migration of data. From SME’s to large organizations, GTM is great, it is free and another alternative to tag management system. So switch now! Previous Article6 Important SEO Trends of 2019 You Need to Know! Next Article Plan Your Campaigns for April with Twitter Marketing Calendar!